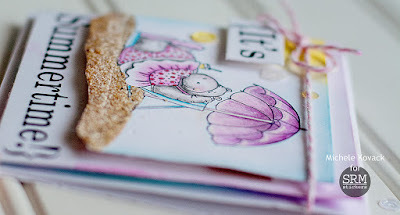 Thoughts of a Cardmaking Scrapbooker! : Summertime!! 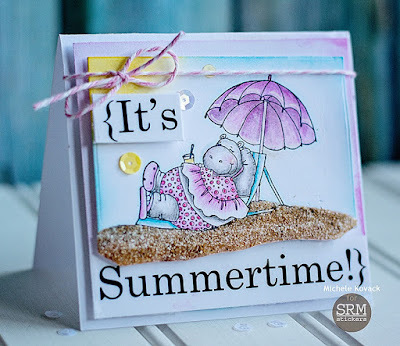 I am up on the SRM Blog today with a summertime card. This stamp is by Great Impressions. It was from 2007...so I just completely dated myself and proved that I can't throw anything away! ;). I stamped it with black Memento ink, then used used my Polychromo pencils to color it. I applied glossy accents and real sand to the sandy part. I cut it out using a square die but cut the bottom portion by hand. I sponged the edges in blue and a bit of yellow for some sunshine. I used SRM's Sentiment Summer sticker and a few sequins to finish off the card. Our town does a big Fourth of July parade Friday, complete with fireworks. I love this night because even though we live in Chicago, our town feels a bit like Mayberry. Everyone will have company, swim in their pools, and in a way, celebrate together. I am having company as well and have been getting my house ready. It feels good to have the house finally finished so I can enjoy the rest of the summer work free! Oh my goodness, that hippo in a two piece is utterly adorable. You have great coloring skills. This is a fabulous summer themed card. Thanks so much for sharing. I think they should re-release that stamp, it's fantastic. :) Your Fourth of July celebration sounds amazing. Lucky! ACK! How adorable is your hippo, decked out in her sweet swimsuit, lounging under her umbrella! The real sand is *the* perfect added touch! You really have a knack for colouring with polychromomos pencils: WOW! Your 4th of July celebration sounds like such fun! We'll be in the US on Canada Day, so will miss celebrations here...then back in Canada on the 4th, missing US celebrations there. Need to find fireworks to enjoy at some point! Thank you so much for visiting my blog; sparkle added to my day! Your card is so pretty! I really like how you've colored with your pencils and the sand makes it look even better! Have a happy 4th! Super cute card Michelle. Love the sweet image, the soft coloring... the sandy beach is amazing! Hi Michele, That card is adorable. Thanks for stopping by my blog and leaving your comment about my Greyhounds. 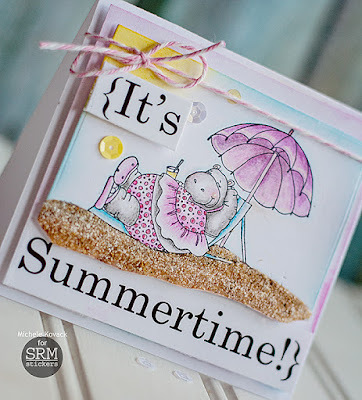 This is such a fun summer card, Michele! I love the sweet little hippo and the addition of real sand!! Sending wishes for a wonderful day. What a darling card and that image is so cute -- no need to throw it out. Thanks so much for stopping by my blog and leaving some comment love. I hope you'll be back soon! That's so cute, Michele! I wouldn't give it up either. Definitely a keeper. Love the sand, and your coloring is top notch. I'm glad you'll be able to enjoy your summer with the kitchen remodel done. Your 4th of July celebration sounds wonderful in your town. We've had a north wind blowing here the last few days so I'm trying to stay on the sheltered side of the house where it's warm. Oh, my, your card is so cute. Ms Hippo is adorable. I love the sand and your coloring. Kitchen Remodel, Before and After!